I’ve always loved aerial photographs and when the Aerofilms collection was acquired by English Heritage Archives, I looked forward to the opportunity to use some of the photographs from the collection. It came with the work that I was carrying out with Kathryn Morrison on the impact of the car that resulted in our book, Carscapes: the Motor Car, Architecture and Landscape in England. We used several Aerofilms images but, after a long trawl through the albums of file prints, it became clear that there were far more photographs than we could possibly use in one book. I got the idea of producing a book, based entirely on Aerofilms photographs, that would graphically illustrate the changes brought about by the car and other forms of road transport in England since aerial photography began on a commercial basis just after World War One. 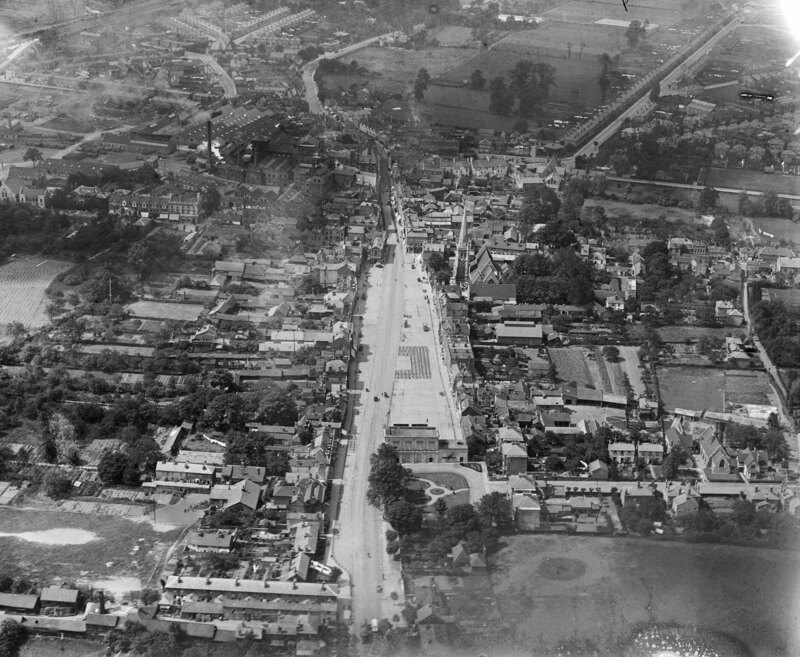 Romford in 1920 was still, at heart, a country town with gardens and fields behind the market square. Today, engulfed within suburbia, it is completely urban and surrounded by car parks and relief roads. 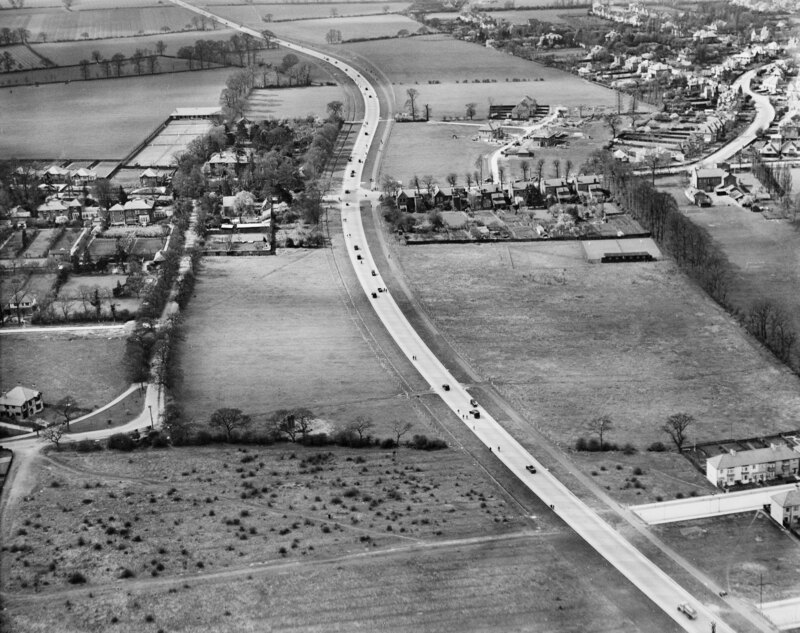 By the 1920s, in a few parts of England, arterial roads such as the Kingston bypass, seen just after opening in 1928, were starting to change the landscape. Within ten years, all this land had been built on and the road had been turned into a dual-carriageway. 1920, which is when the photography began in earnest, is actually a great starting point. In 1920, there were just 187,000 cars in Great Britain; by 1930, that figure had risen to a little over 1 million. Looking at the images from the early 1920s, something stood out immediately: cars were conspicuous by their absence. Although the first car arrived in England in 1895, nothing had really changed visually as a result. What is preserved in these pictures is Edwardian England, the England of the horse, the tram and the train. It is though we were looking through a mirror at a country that was much as it had been in the nineteenth century. Many country towns and villages had grown little since the 1860s. The Victorian suburbs that surrounded our cities were still almost exactly as they were when they were built; both the leafy avenues and crescents that housed the well-to-do and the regimented terraces of the workers. 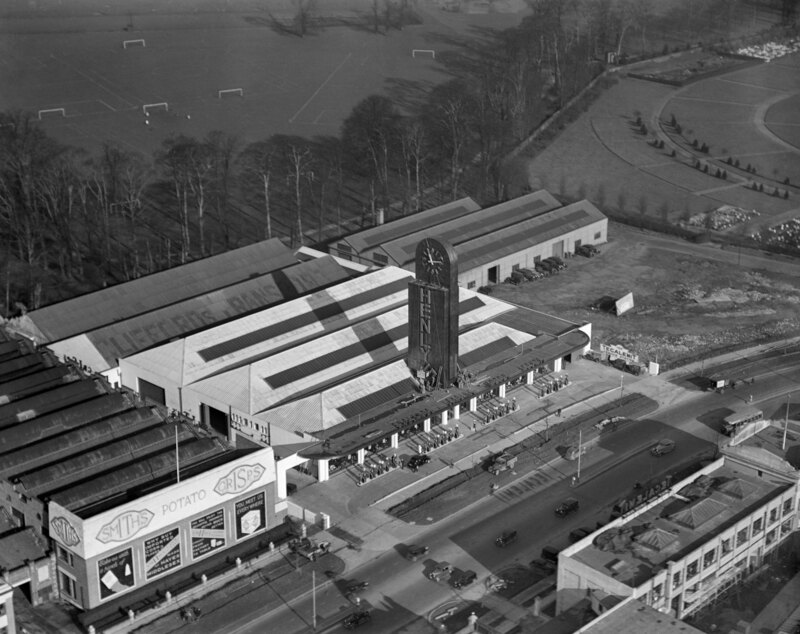 New and impressive buildings to serve the motorist were built in increasing numbers by the late 1930s such as Henly’s Garage on the Great West Road at Brentford, opened in 1937. 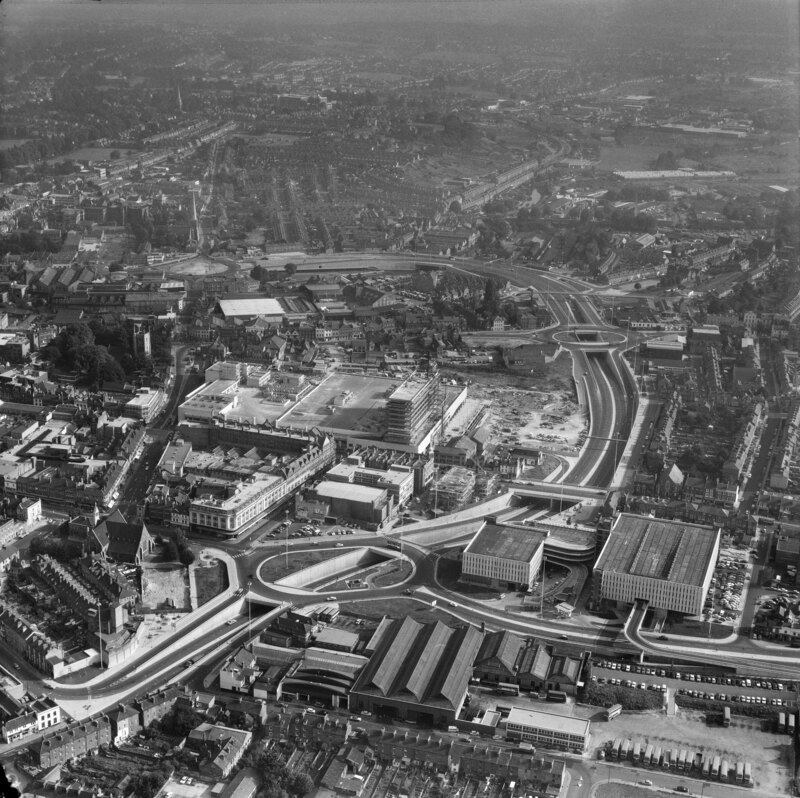 This view of Reading in 1971 exemplifies what was going on all round England at that time as new inner ring roads made their mark on the urban environment. Changes begin to appear in the 1920s. New housing estates of small semi-detached houses can be seen under construction, motor vehicles start to appear in the streets, mainly small buses at first, and then, from the late 1920s, you start seeing more and more cars. The broad and straight new arterial roads and bypasses begin to cut across existing lanes and field boundaries. But places don’t really start to change much until the end of the 1930s and, even then, the impact is still quite limited. The real change comes in the 1960s and 70s when the results, familiar to all of us, of comprehensive redevelopment and the reconstruction of places to cater for cars, become apparent. Aerial photographs really bring out, much more so than those taken at ground level, just how invasive some of these road schemes were and how the centres of cities became completely isolated from their suburbs, forcing people into subways to get from one to the other. The picture was not all bad: in some places, brave experiments were made to try and ensure that people and cars could exist in harmony. Occasionally, one picks up just a little of that buzz from an era when we perhaps had a stronger belief in progress and an exciting future – the sort of world captured in those wonderful Gerry Anderson TV puppet series of the 1960s, such as Thunderbirds. Sadly, it doesn’t happen all that often. 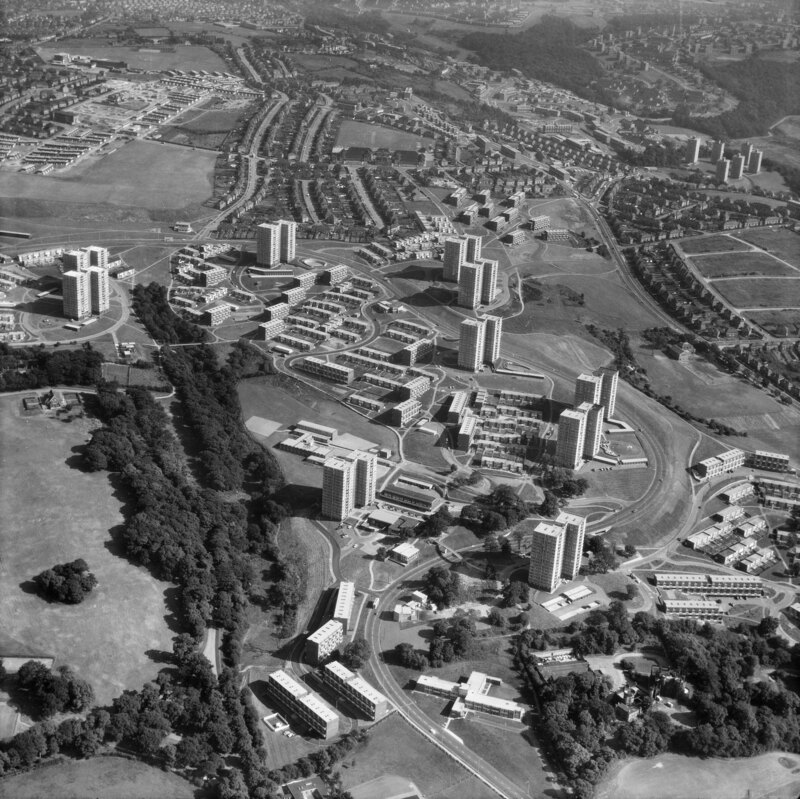 A vision of the future as it might have been: Norfolk Park estate, Sheffield, when brand new in 1969. Set in parkland with footpaths leading to the houses and flats, people and cars are completely separated. A brave experiment, most of it has now been demolished. I’ve tried to bring out all these aspects of change in the book and have also illustrated how older means of transport, such as electric trams and even, in one seaside resort, horse trams managed to carry on. So the book is as much about continuity as change and begs the question – what have we lost and what have gained? As for the answer, I’ll leave you to decide. John Minnis is a Senior Investigator in the Heritage Protection Department based in Cambridge. He is interested in the impact of roads and railways on the landscape and in the buildings that served these forms of transport.